This is a bit of a computer-y post, so perhaps will be of interest to few. Now this is well and good, but I really wanted to manipulate the data programmatically. For one thing I knew that the works were in the same order as the Thesaurus Linguae Graecae entries – 001-156 – which meant that all I needed to do was number them. But I didn’t fancy typing that in. Of course it is really easy to get the start and end tags mismatched, so I used a free online validator to check the XML, just pasting it in, and dealing with whatever errors it found. I avoided reformatting the XML in Notepad++, tho. I did install the XML plugin, and tried it out; but it made the file much less compact – not a great idea if you are paging down it and filling in blank fields, as it doubles your keystrokes. So far so good. But I was beginning to feel the need to start turning the XML into something that could be used in a web page. That meant coding. A moment’s thought suggested that I use perl. I installed Strawberry perl, at the suggestion of the learn.perl.org site. I had a lot of trouble installing other types of perl. This done, I looked for a bit of sample code, which I found here, using the XML::LibXML library. This I adapted. I got a lot of “Wide character in print” messages, which turned out to be unicode-related. I had to specify in the perl to use utf-8, and also that the STDOUT should use it too (see my code below). When the script ran, the Greek was gibberish. So I changed the windows console font to “Lucida Console”, and also specified that the code page for it to use was utf-8 by entering the command “chcp 65001”. But once I had this running, it was fine! Of course then I had to decide what I wanted my output to look like. I built it up, a bit at a time. I found there was more than one translation; so I had to create a nested array of translations. Some translations had a url, because they were online, so I needed a way to have a url. I had to break up the original <translation> tag above into <info> and <url>. But I managed. I kept validating the xml file, and I kept running my perl script. Not bad! The first entry is a bit messy, but that was a vice of the original data. 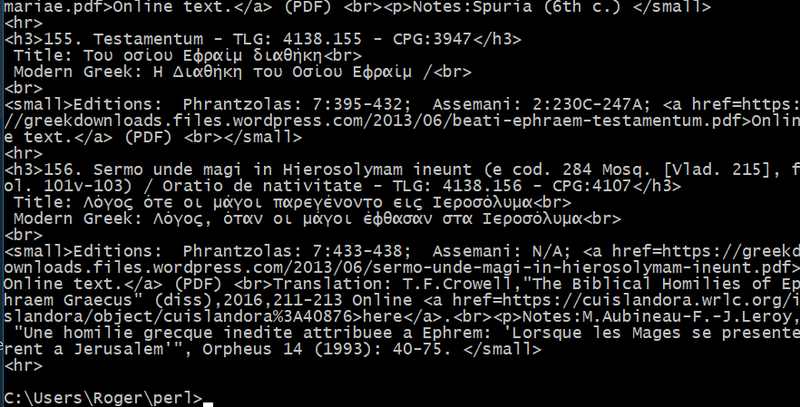 The Phrantzolas edition doesn’t give a title in Greek for the whole work, only for each of 26 bits. Nor is there one in the CPG. The links I made up from the <url> tags that were in my file. I didn’t add much formatting, other than <small> on the editions etc line. It’s fairly plain HTML. My guess is that it will paste into a WordPress page quite nicely, in the “Text” tab in the editor. It may need some rejigging, but the code is hardly complex. This contains the script, a.pl (if I have to type “perl a.pl > op.htm” I want as few characters as possible), the xml file input.xml, and a sample output, op.htm. Of course the bibliography could be extended mightily, but I don’t propose to do this. What I really wanted was the cross-reference between the old Assemani edition, the new Phrantzolas edition, and the CPG, plus any translations that were around. We’ve got more than one translation already for some works. All this did take a while! But it was worth it.